Deb: What piece of advice would you offer authors who are just starting out? Katie: Oh, that’s a good question, and I’m going to assume you’re already working on honing your craft. 😉 Just getting your name out there can feel like such an uphill struggle when you’re starting out, whether you’re publishing independently or trying to get that first contract. I’m not sure whether this would be the same for authors in the general market, but for those writing for the Christian market, I would say get involved in the author/blogger/reader community—and I don’t mean advertising yourself. Join Facebook groups, visit book review blogs, comment and interact. Build up relationships, and you will have an amazing network of people who can support you, answer questions, and point you in the right direction when you’re feeling lost and overwhelmed. Deb: I absolutely agree. I would have quit long ago if it wasn’t for my blog-mates helping me along as we all went from barely published to so busy we barely have time to blog! 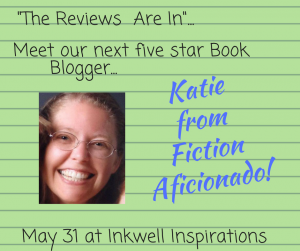 Katie: I’d love it if all readers became reviewers! You don’t have to have a blog to review books, and authors really rely on those reviews for visibility, particularly on Amazon. Other than actually buying the book, it’s probably the single most important way you can support them. It doesn’t have to be a long review. Just share what you enjoyed or didn’t enjoy about the book—politely in the latter situation! Deb: Any advice for those readers who are considering becoming reviewers? Katie: If you’re thinking about setting up a blog, get involved in the author/reader/blogger community. (Hmm… that advice sounds familiar… J ) Facebook groups are great for. Visit other book bloggers and interact on their pages. Get a feel for what sort of things readers respond to. But above all, be yourself. Bring something uniquely you to your blog. Oh. And learn how to say ‘no’, even when it almost kills you. Because at some point you will find the number of books you want to review exceeds the time you have available. I guarantee it!